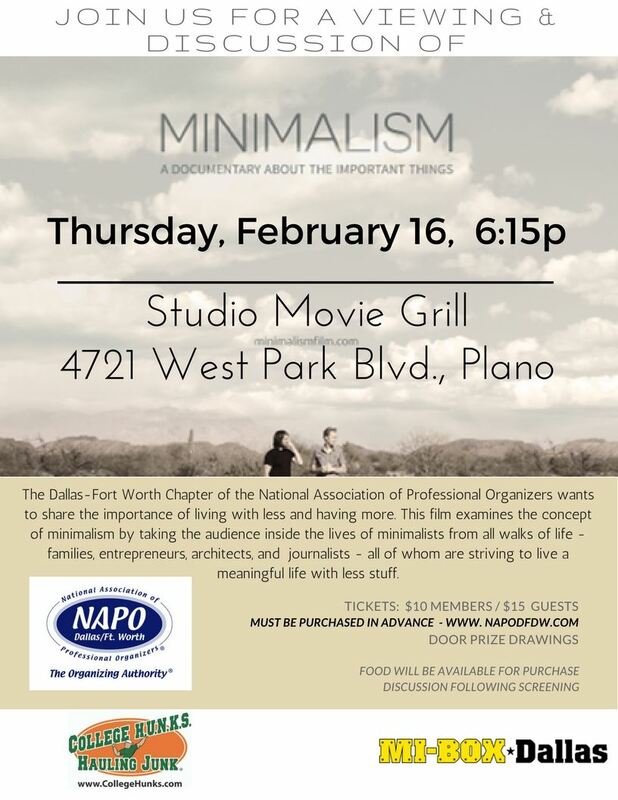 NAPO DFW - Screening of "Minimalism: A Documentary About the Important Things"
Screening of "Minimalism: A Documentary About the Important Things"
Tickets MUST be purchased ON-LINE in advance through the NAPO-DFW Website. Last day to register/buy tickets is 2/15/17. Seats are limited! Please reserve yours TODAY! Doors open 6:15 for networking and food/drink orders. Following the screening, we will spend 30 minutes discussing your thoughts on the movie, the minimalist movement, and answer any questions, along with drawing for prizes!